Black and White Triple Undersink Filter. Undersink filters require no drain connection and do not need electricity. They are easy to install and easy to maintain. Filter carbon is the heart of all good drinking water filters. No matter who makes the filter, filter carbon is the essential ingredient because of its excellence at removing chemicals, whether they are disinfectants added by city water suppliers or the thousands of possible pesticides, herbicides, drugs, and petroleum products that are in the environment. It stands to reason that a double or triple filter with large 9.75″ X 2.5″ cartridges can hold a lot more filter carbon than tiny single-canister cartridge filters like Pur or Aquasana. In general terms, the “the more the better” rule is especially true when it comes to removing challenging chemicals like chloramines and volatile organics (VOCs). The more carbon, the more contact time the water has with the carbon, and the more effective the filter is. Standard-sized filter cartridges, especially the most standard of all, the 9.75″ X 2.5″, are available in many varieties and from many manufacturers. When makers of single canister units add specialty materials to remove contaminants like lead or arsenic it is at the expense of the carbon content. To add the specialty resin, they leave out some carbon. With multi-canister filters, full sized carbon filters are present even when specialty cartridges are added. Great variety in cartridge selection allows the filter user to customize the drinking water filter for his or her own water. With single cartridge systems it’s “one size fits all,” so you’re stuck with an “average” filter designed to do an average job on everyone’s water. A filter that does everything doesn’t do anything very well. The table below contains a few of the many cartridges available in the standard 9.75″ X 2.5″ style. A click on the filter name will take you to a lot more information about the cartridge. FC001 MatriKX “CTO Plus” (formerly called KX-1). 0.6 Micron Carbon Block, Bituminous Carbon High Chemical Capacity. Great Chlorine and Chloramine reduction. Our favorite carbon block and standard cartridge for single filters and double filters. Incredible 20,000 gallon chlorine reduction capacity. FC002.MatriKX “VOC” (formerly called KX-5). 0.6 Micron Carbon, Block, coconut shell carbon. High Chemical Capacity. Great Chlorine and Chloramine reduction. Especially good at VOC reduction. A popular cartridge that makes great tasting water. FC004. MatriKX PB-1. 0.5 Micron Carbon Block with Heavy Metals Resin added. High Capacity Chemical Cartridge, also removes lead and heavy metals plus cysts (giardia and cryptosporidium). A long-time favorite for single and double filters. FC027. Pentek Chlor-Plus 10. 1 Micron Carbon Block. Pentek Chlor-Plus 10 one-micron Carbon Block, designed especially for Chloramine Removal. 2,500 gallons of chloramine reduction at 0.5 gpm–1,000 gallons at 1.0 gpm. FC008. PWP KDF1.5 GAC Granular Coconut Shell Carbon with 1.5 lbs. of KDF 55. Our own KDF drinking water cartridge. Long-term dechlorination, lead reduction, and excellent taste/odor improvement. FC011. PWP Fluoride Reduction Cartridge. Granular Activated Alumina Cartridge, made with Resin-Tech’s SIR-900 Fluoride Resin. Our high quality fluoride cartridge made with the purest activated alumina. Also removes arsenic and lead. FC708. Doulton Imperial Super Sterasyl Free-Flowing Ceramic Cartridge with granular carbon core. Doulton Imperial Super Sterasyl open end cartridge. Large diameter Super Sterasyl—ceramic/silver outer shell with granular carbon core for chemical reduction and taste/odor improvement. Removes bacteria, cysts, chemicals. FC020. PWP Centaur/KDF 85. Super Problem Well Water Cartridge. Our own granular cartridge designed for well water with sulfide and/or iron. Contains 1.5 pounds of KDF 85 (special iron/sulfide grade) with Centaur catalytic carbon, a specially designed carbon for sulfide/iron. FC005. Flowmatic Arsenic Cartridge. Granular Iron Oxide. Flowmatic Iron Oxide Arsenic Removal Cartridge. Uses the safe and effective granular ferric oxide technology which is effective against both types of arsenic (Arsenic V and Arsenic III). The cartridge is rated for 1000 gallons of arsenic reduction at 0.75 gallons per minute. 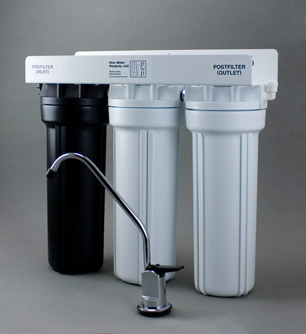 Here are some suggested triple-filter combinations for drinking water filters. Refer to the part numbers in the table above for cartridge identification. A. Standard city water disinfected with chlorine. FC001. FC002, FC004. This makes a super chemical filter with lots of carbon, plus heavy metals and cyst capability. Excellent VOC remover. B. Standard city water disinfected with chloramine. FC027. FC002, FC004. This makes a super chemical filter with lots of carbon, plus heavy metals and cyst capability. Excellent VOC remover. C. Standard city water with chlorine and fluoride added. FC001, FC011, FC004. Excellent chemical filter, plus fluoride reduction. Removes lead and cysts as well. Substitute FC027 for FC001 if water is treated with chloramine. The MatriKX VOC coconut shell carbon block. reduction, arsenic, and bacteria/cyst/virus protection. These are a few examples, but cartridges can also be added to treat such issues as nitrates, hardness, iron/manganese, scaling, low pH, etc. 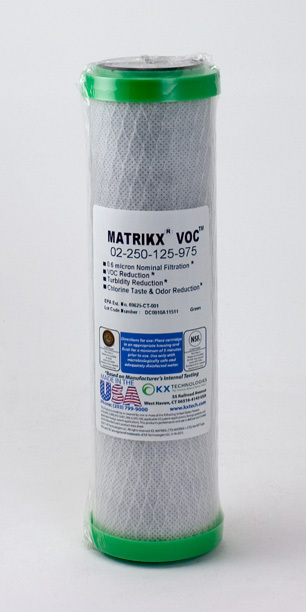 The MatriKX VOC coconut shell carbon block pictured on this page is one of the many superior cartridges available for use in multi-cartridge filters. The VOC is made with micro-pore coconut shell carbon in a tight 0.6 micron format. It’s a great chlorine reducer, a fine all-around chemical filter, an excellent taste enhancer, and is especially good at removing the disinfection by-products known as THMs.